A short, linear hack that has Samus in ball form the entire time. 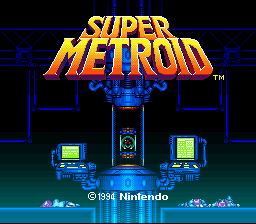 This also sets up the possibility for a much longer hack to be built off of this one in the future, since it doesn’t play much like a traditional Metroid game. B2-TW is a very interesting little hack. There isn’t too much to offer, but it provides some interesting little things in the way of Morph Ball movement. 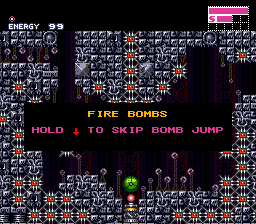 The entire hack takes place in Morph Ball, and you even save in squat little save stations. The biggest issue, besides the exploitable end boss, is that the hack is really, really small. It has enough interesting things in it to provide some more rooms with extra challenges, but it is kept minimal. 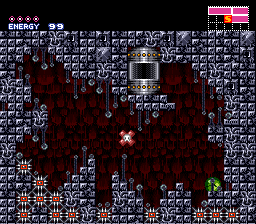 However, it does give you a few interesting things, such as platforming across moving and/or appearing/disappearing blocks. The Link to the Past Zelda tiles are also a nice giveaway that those blocks do something. B2-TW is a nice little hack that will provide some entertainment for about 5 minutes. It might also give you some ideas of what you could do in a full-sized hack with the Morph Ball, but that is really it. It ends way to fast, and that ultimately is the biggest gripe with it. There could have been some more inventive puzzles added in. It fells like a little tech-demo showcasing some interesting things in Morph Ball, and nothing more.